When you have kids, people always tell you, "enjoy every minute because they grow so fast!!" I nod in agreement to be polite, but it's been my experience with my own child that that's not necessarily true. There are some days that just seem to last FOREVER, and when I think back to when Brady was born, it certainly does not feel like just yesterday. In fact, with #2 on the way, I honestly feel like it's been an eternity since we were caught in the haze that comes with having a newborn. All of a sudden it hit me, just how fast my son is growing up. It's been going on all along, right in front of me, but I just couldn't see it until I actually, well, saw it. It hasn't even been a full year since these two pictures were taken (only 9 months, almost to the day) but the boys in these two pictures are so very different. 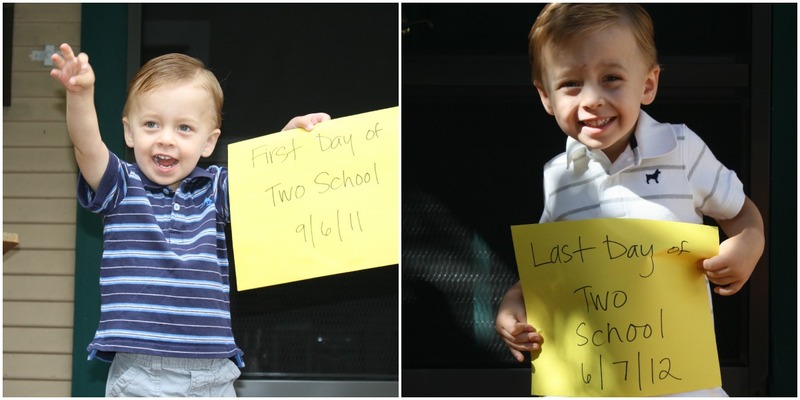 I remember taking the picture on the left and it really does feel like just yesterday. I remember what he didn't eat for breakfast that day; the anticipation of his first day alone at a brand new school was just too much. He couldn't stop talking about Lyla (well, some things never change) and Tiramisu & Blanca, the guinea pigs at school. I can hear his voice so clearly in my head-- the tone, the intensity, the vocabulary... everything is so different now. The boy on the left is wearing diapers, the boy on the right undies. The boy on the left was so into Joe Bonamassa that I thought we'd have ourselves a professional guitar player at the age of 5. The boy on the right turned in his electric guitar for a Batman cape and boatload of Matchbox cars, and now all he talks about is superheros, cars, racing, and fighting bad guys. The boy on the left slept in a crib. The boy on the right just moved into a brand new big boy room, complete with a twin bed and no bed rails (yikes!) The list goes on and on. There are still a lot of similarities in these two boys, don't get me wrong. They both take forever to get out of the house in the morning (gotta pack up that ridiculous plastic Ziploc baggie full of cars!) Neither one of them wanted to take these photos, but then hammed it up when it came down to it. Both are fiercely independent in their minds, but still need me to do all the little things (thank goodness!) Both love, and have always loved, going to school. I hope that never changes! There are "phases" he'll go through that I hope will go by quickly, but even on the longest, most difficult of days, he's changing and growing right under my nose... and I'll never be able to go back and get those days back. Ever. It may have taken me a while to really get it, but I do now. And I won't ever take a moment of his life for granted again. OMG Heather!!! You are making me cry at work!!! So true though. I feel like 2 years really has been 2 YEARS - but then I look at pictures and she was such a baby last year at this time!